This time, we’ve made these sweet Honey Garlic Chicken Wings with our pressure cooker. And the chicken wings were unbelievably moist, fall-off-the-bone tender, and packed with flavors! Make these if you’re looking for something quick & easy, healthy, and kid-friendly. Though it’s often made as a finger food for parties and gatherings, it’s also great for an easy family dinner. Enjoy! Marinate the chicken wings with the Chicken Wing Marinade for 20 minutes. 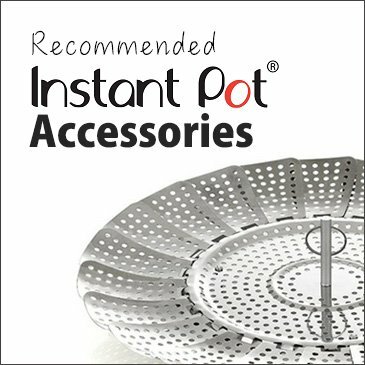 Instant Pot: press Sauté button and click the adjust button to go to Sauté More function. Instant Pot: wait until the indicator says HOT. *Pro Tip: This prevents the chicken wings from sticking to the pot. Add 1 tablespoon of peanut oil into the pot. Ensure to coat the oil over the whole bottom of the pot. Add the marinated chicken wings in the pot (do not discard the chicken wing marinade). Then, brown the chicken wings for roughly 30 seconds on each side. Flip a few times as you brown them as the soy sauce and sugar can be burnt easily. *Pro Tip: Remember to flip the marinated chicken wings as you brown them in the pressure cooker because the soy sauce and sugar can burn easily. Reduce the heat to medium (Instant pot: press cancel button, then press sauté button). Add the minced shallot, star anise and sliced ginger, then stir for roughly a minute. Add the minced garlic and stir until fragrant (roughly 30 seconds). Mix 1 tablespoon of honey with ½ cup of warm water, then add it into the pot and deglaze the bottom of the pot with a wooden spoon. Place all the chicken wings with all the meat juice and the leftover marinade in the pot. Taste the honey soy chicken wings and the honey soy sauce. Season with more salt or honey if desired. Remove all the chicken wings from the pot and set aside. Turn on the heat to medium (Instant pot: press sauté button). Mix 1 ½ tablespoon of cornstarch with 1 tablespoon of cold water. Keep mixing and add it into the honey soy sauce one third at a time until desired thickness. Turn off the heat and add the chicken wings back into the pot. Coat well with the honey soy sauce and serve immediately! Now it’s YOUR turn to take out your pressure cooker and make some Instant Pot Honey Garlic Chicken Wings! Make these Honey Garlic Chicken Wings with 10 mins prep! Super flavorful & tender honey garlic chicken wings are great for dinners, parties, picnics or BBQ. 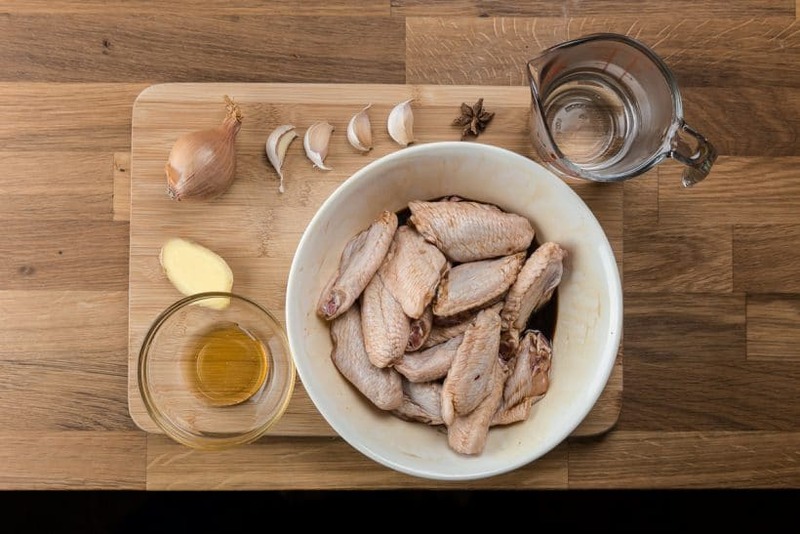 Marinate the Chicken Wings: Marinate the chicken wings with the Chicken Wing Marinade for 20 minutes. Heat Up the Pressure Cooker: Heat up your pressure cooker (Instant Pot: press Sauté button and click the adjust button to go to Sauté More function). 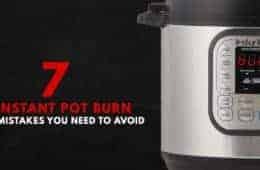 Make sure your pot is as hot as it can be when you place the chicken wings into the pot (Instant Pot: wait until the indicator says HOT). This will prevent the chicken wings from sticking to the pot. 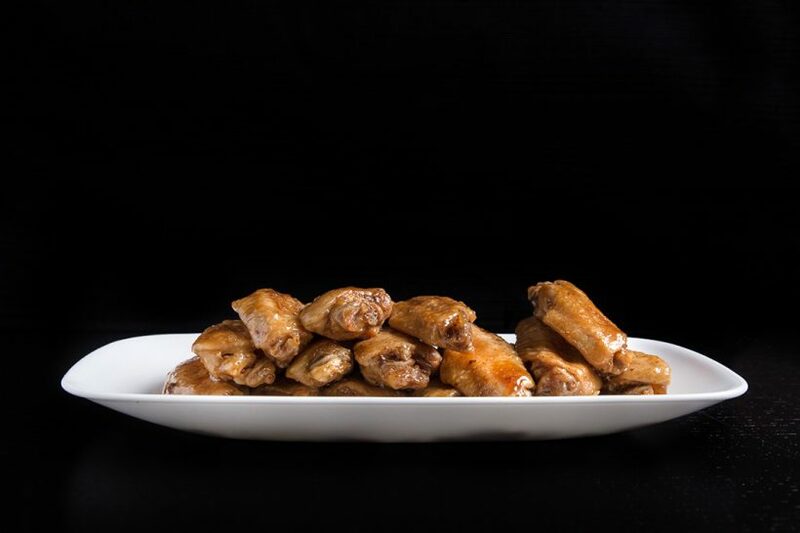 Brown the Chicken Wings: Add 1 tablespoon of peanut oil into the pot. Ensure to coat the oil over the whole bottom of the pot. Add the marinated chicken wings into the pot (do not discard the chicken wing marinade). Then, brown the chicken wings for roughly 30 seconds on each side. Flip a few times as you brown them as the soy sauce and sugar can be burnt easily. Remove and set aside. Sauté the Shallot, Star Anise, Ginger, Garlic: Reduce the heat to medium (Instant pot: press cancel button, then press sauté button). Add the minced shallot, star anise and sliced ginger, then stir for roughly a minute. Add the minced garlic and stir until fragrant (roughly 30 seconds). 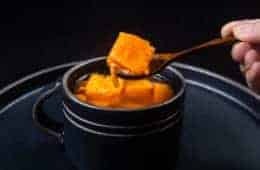 Deglaze the Pot: Mix 1 tablespoon of honey with ½ cup of warm water, then add it into the pot and deglaze the bottom of the pot with a wooden spoon. Pressure Cook the Chicken Wings: Place all the chicken wings with all the meat juice and the leftover chicken wing marinade into the pot. Close lid and pressure cook at High Pressure for 5 minutes (Electric or Stovetop pressure cookers). Turn off the heat and fully Natural Release (roughly 10 minutes). Open the lid carefully and taste one of the honey soy chicken wings and the honey soy sauce. Season with more salt or honey if desired. Thicken the Honey Soy Sauce: Remove all the chicken wings from the pot and set aside. Turn on the heat to medium (Instant pot: press sauté button). Mix 1 ½ tablespoon of cornstarch with 1 tablespoon of cold running tap water. Keep mixing and add it into the honey soy sauce one third at a time until desired thickness. Coat and Serve: Turn off the heat and add the chicken wings back into the pot. Coat well with the honey soy sauce and serve immediately! Remember to flip the marinated chicken wings while browning as the soy sauce and sugar can be burnt easily. *Total cooking time does not include the inactive time required for marinating the chicken wings. hi Amy and Jacky, i want to try this with frozen chicken wings… marinading wouldn’t help as wings are frozen right? what would you suggest i do with frozen wings? how long to cook? can i keep the same amount of liquids/marinade ? with 1.5 lbs of wings, would all the wings be submerged? i worry that the wings that are not submerged in the liquids would not get cooked properly esp when frozen. thanks for your help and the great recipes you have posted here! Marinading overnight will help the frozen wings as they thaw. For frozen wings, I would highly recommend at least partially submerge them in the cooking liquid. It will take roughly 6 minutes and natural release to cook them fully from frozen. With 1.5 lbs wings, you should be able to partially submerge all of them in the cooking liquid. It sounds like the wings were slightly overcooked. For many Asian dishes, the chicken wings are supposed to be braised until they are soft and almost fall off the bones. You may want to reduce the cooking time by a minute next time. when you do recipes like this please make a printable one. my printer showed a choice of 45 pages when actually I only wanted 7 which is still far too many. There is a printable version for all the recipes. There is a print recipe button on the recipe card at the bottom. I do love your recipe. If I cook 3-4 lbs chicken wing, how should I adjust the recipe and cooking time? I would decrease the cooking time by a minute as the get up to pressure time will be longer. You will probably want to add a little more honey as there will be more juice from the chicken wings. Please taste and adjust accordingly. After sauté the garlic, ginger, etc, Can I just put the raw chicken wing directly in the pot then pressure cook them together? Why need to sauté chicken wing firstly? Sauteing makes the overall dish taste better. If you don’t mind, it is fine to put the raw chicken wings directly in the pot to pressure cook. Hi, this dish sounds amazing. However, we have several food allergies in our house. Cannot have peanut, wheat, tree nut and a few other foods (including sesame). Can the following substitutes be made? EVOO for peanut oil, San-J (wheat free) light soy sauce and regular (for dark). Also is the star anise in any nut family? Thank you! Love following your page. Yes, you can use EVOO for peanut oil. I would recommend skipping the dark soy sauce and just use the regular soy sauce. I believe star anise is a nut, but please confirm it before using. Hi Jacky and Amy! I did this once before and I loved it. I want to make it again today but I don’t have peanut oil at hand. Can I sub it with canola or sesame oil? Thanks! Canola oil will work just fine! These wings look so good but why do you all have to make it with such exotic ingredients – like Shoaxing wine? and two different kinds of soy. They don’t have any of that here in Kentucky. Shaoxing wine can be substituted with Dry sherry wine. One of the soy sauce adds saltiness and the other adds color and sweetness to the dish. You should be able to find them on Amazon. If i want to crisp the wings, Would I put it in the oven before or after coating the wings with the honey sauce? Adding the honey sauce to the chicken wings before placing them in the oven will help them caramelize better! Howdy! We need to make these wings and then transport them to a party. How would you recommend cooking at home and then reheating the wings at the party? I would make a lot of them and transport them with disposable aluminium tray. Place them in the oven to reheat them so the skin will crisp up a bit as well. Take care & have fun at the party!! Delicious! Every recipe of yours that I have made has been fantastic. Thank you, Thank you! These wings did not last for leftovers! If I have a soy sauce that doesn’t specify if it’s a light soy sauce…is it considered light? If it doesn’t say what kind of soy sauce it is, then it should be light or very similar to it. We love this recipe! What is the best way to make twice as many wings in the same amount of time? Do we just double all the ingredients but keep the cooking time to 5 minutes? Thanks! The liquid ingredients can be increase 1.5x instead of 2x. The cooking time will stay the same! Sorry to hear the star anise was too much for you. Did you add 1 or 2? Please take care & have a great week! This recipe is absolutely fantastic! I made a couple of adjustments to meet the tastes of my family. I added a touch of toasted sesame oil to the marinade, and some red pepper flakes to the veg mixture. Out of this world! I served it with a sriracha/mayo dipping sauce (1/2 c. mayo and 2 T. sriracha, plus a dash of paprika and garlic powder), though it didn’t really need it. Thank you so much for sharing this! The additions you made sounds great! Made this last night using legs (wings did not have a good sell-by date) and they were fabulous!! The flavors were so good that we were commenting on them for the rest of the evening. 🙂 Oh! And the smells while it was cooking! WOW! This is a great recipe. Definitely will be having this again and again. I’ve been using all your recipes! Most of them came out great! I need to work on the ones with rice it either comes out too dry or too soggy. 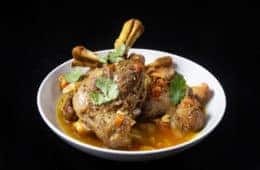 I was wondering if you guys have any recipes with lamb? We don’t have any lamb recipe on the site yet. We have a goat curry that can be substitute with lamb easily. Hi, I don’t have a shallot on hand, can I use green onion or yellow onion to sub? I also don’t have star anise but I do have Five Spice powder. Can I substitute that and if so what amount would you add? Looking forward to trying this recipe out!? yellow onion will work as a sub for shallot. As for five spice powder for star anise, it will change the taste of the overall dish. 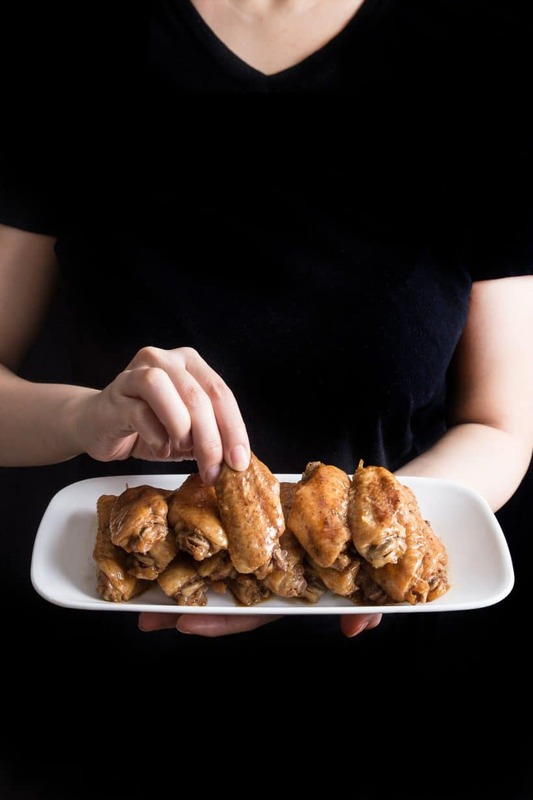 Is it ok to substitute the wings with drumsticks? Would I have to change the cooking time…? Thanks! The cooking time will be changed to 8 minutes + Natural release. What is the maximum amount of wings I can make for this? I know your recipe said 1.5lbs..can I make up to 5 lbs? if so, will the time change or stay at 5 min? Thanks! As long as the wings are partially submerged in the cooking liquid, the cooking time can stay at 5 minutes. Another layer of wings on top of the wings should be fine too! Too many wings will increase the get up to pressure time and will overcook some of the wings! My eight month old eats dinner with us. However, kids under 1 can’t have honey. Can I substitute the honey with agave syrup? Or something else? Thanks! Yes, brown sugar will work as well! In your recipe you describe the saute step as being done in the instant pot, but your video shows the saute step being done in a pan. 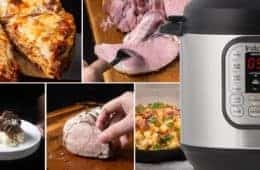 Why did you choose to use the pan vs. the instant pot and what is the actual best method for this dish? My apologies, I meant to say the browning step instead of saute. It can be done in the Instant Pot as well. Just make sure to wait until the chicken skin release itself from the pot before flipping them or the skin may stick to the pot! I like you honey soy wings recipe, I’ll give it a try soon. 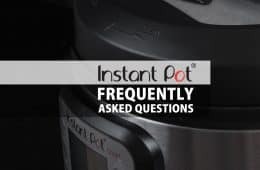 What is the difference between a pressure cooker and an instant pot? Love watching your videos! 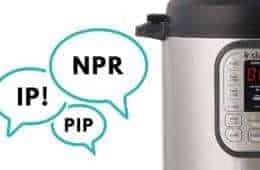 Instant Pot is a brand of an electric pressure cooker. It is a pressure cooker and also have other functions such as yogurt making and slow cooking! Can I substitute legs and thighs to make this into a meal? Would the cook time need to be increased? Yes, you can substitute legs (8 minutes) or thighs (7 minutes) to make this into a meal. What’s a good substitute for shaoxing wine? I can’t use any alcohol in my recipes due to allergy but love many of your recipes that use it. Is there an equivalent I can use? The dish will come out slightly different. Does this recipe create a crispy skin on the chicken wings? Is there any method of doing wings in the Instant Pot that achieves crispy skin? Thank you!! The pressure cooker cannot create crispy skin as it is a wet cooking environment. The only way to achieve crispy skin is to finish the wings in the oven or airfryer. what is the difference between dark and light soy sauces. Can I just double up on the regular soy sauce I get at the regular market. Light soy sauce is a lot more salty than dark soy sauce. It is considered as the regular soy sauce in Chinese cuisine. Dark soy sauce is more sweet and adds color to a dish. Light soy sauce is not the same as low sodium soy sauce. If you don’t have dark soy sauce, you can omit it and add a little more honey to it. Do not substitute light soy sauce as dark soy sauce or else the dish will be too salty! If I wanted to double the recipe, do I double the amount of water to 1 cup or can I leave it as 1/2 cup? Hi, i don’t own a pressure cooker, how do I prepare tis dish? Hi Marie. Thank you for your question. On Step 6. You can braise the chicken wings on stovetop for roughly 12 minutes. these wings look incredible. i just love the honey & soy flavour combinations – it’s one of my favourites.